Hello, explorers. Exciting stuff this week. A highlighted crew-member running toward a glowing dot. Okay, so this specific thing is not SUPER exciting. 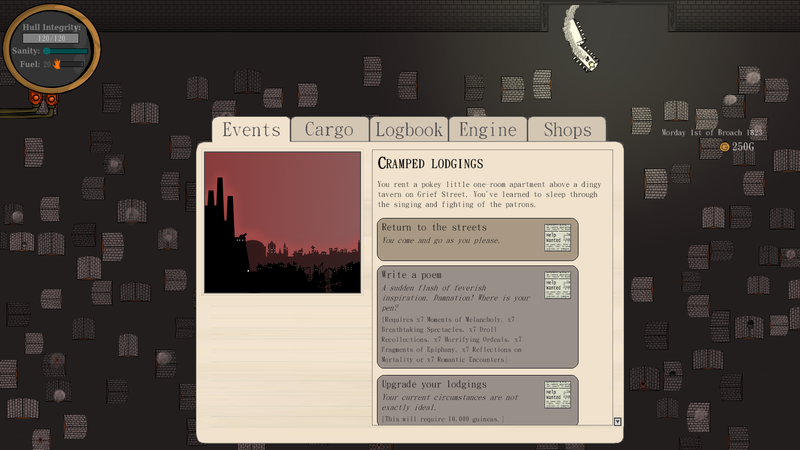 Firstly, combat work has been proceeding nicely. As you can see above, we now have walls – getting your crew to navigate through this little maze was a little fiddly from a programming perspective, and occasionally they still run in very small circles for no good reason, but the pathfinding is almost perfect now and they find the shortest route to their destination 99% of the time. I’ve also spent a lot of time animating various items of crew-member clothing – no more nakedness! Waiting for the ‘Charging’ bar to fill will be extremely stressful when the enemy has artillery too, and you’re being bombarded constantly. 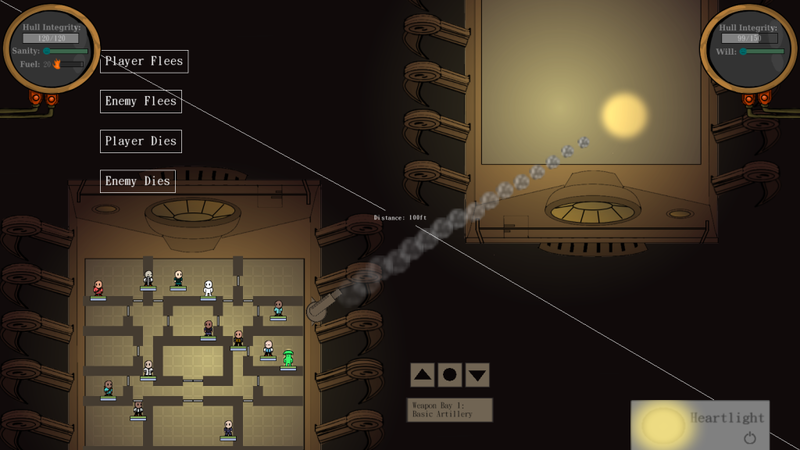 As you can see, I’ve now also added artillery fire, a crucial part of the combat system. Above, you can see me waiting for my artillery weapon to charge on a kinetopede with one weapon. Each kinetopede will be able to have up to 4 weapons overall and there will be dozens of different varieties to choose from, each with different strengths and weaknesses. Now that the artillery has charged, the cursor changes to a targeting reticule. I steady, aim, aaaaaaaand… it crashes. In lieu of sound effects, imagine me making a “whoosh” noise with my mouth. The yellow circle is the explosion. I’m going to improve this, don’t worry. So combat is going according to schedule and is all looking very nice, and over the next week I’ll finally start making the enemy fight back. But I have something else very special to show you that I knocked up this week. One of the major goals of HOMR is to write poetry based on the experiences and events you find as you explore. For example, you might witness something terrible and record this as a Horrifying Ordeal in your Logbook. Later, when you have enough Horrifying Ordeals under your belt, you can write a haunting Gothic poem based on your harrowing experiences. To do this, you must first visit your home in the City of Keys (you can upgrade your accommodation later, but players start out in the Cramped Lodgings). When you’re at home, and if you have enough relevant experiences – for example, Moments of Melancholy or Romantic Encounters – you can write poetry. 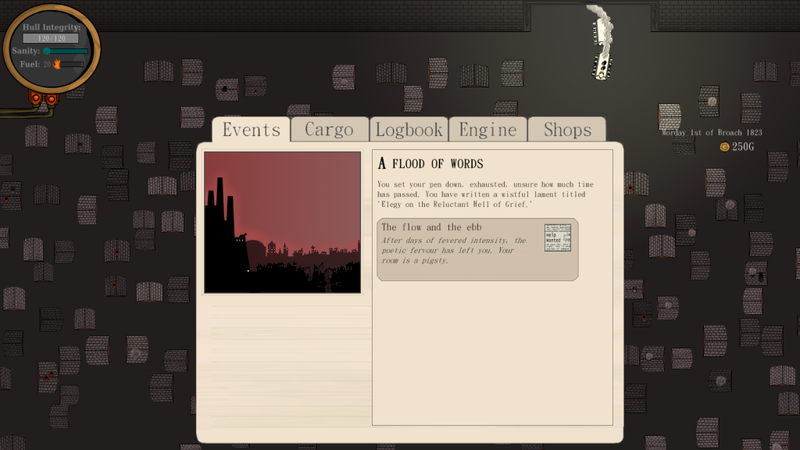 Each poem has a unique, procedurally generated title! This is what I cooked up over the last week. As you can see in the above screenshot, we’ve written a melancholic poem titled ‘Elegy on the Reluctant Hell of Grief.’ This poem will be recorded in the player’s Logbook forever as their first poetic sojourn. 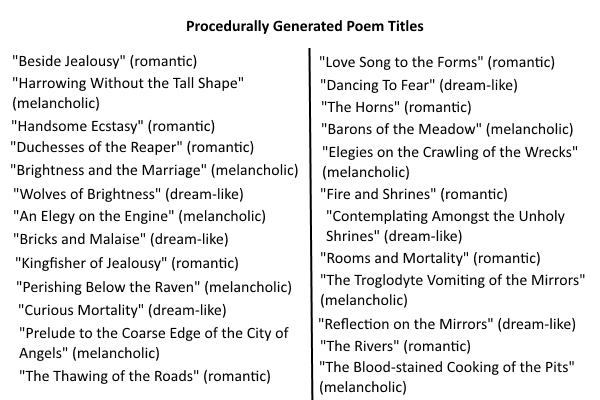 There are currently 2.7 billion possible combinations of poem title. This means that every poem generated by a player is almost guaranteed to be completely unique to them and their game session. I could sit and generate these poem titles for hours. And by ‘could,’ I mean now you know how I spent Thursday evening. Thanks for reading! Next week: Enemies who don’t just sit there and take it.